Review: Michelle Williams is stunning in flawed biopic "My Week With Marilyn"
“My Week With Marilyn” is a mediocre film anchored and enhanced by one of the most incredible feats of acting I have ever witnessed. Michelle Williams stars as Marilyn Monroe, and delivers a captivating performance of blinding power, one I was completely unprepared for. Though she looks little like the real Monroe, Williams inhabits the role flawlessly, tapping into everything that made Marilyn the icon she was with delicacy and nuance. I can safely say I have never gained such insight into a historical figure by watching a film before, but little of that is due to the script or direction. There is almost nothing remarkable about the narrative, aesthetics, or other performances. What I loved about the movie starts and ends with Williams, who spectacularly elevates this material; when she wasn’t on screen, my interest didn’t just wane, it disappeared. But when she is there, the film is absolutely, utterly captivating, and I have no qualms recommending the film on her performance alone. The key insight, for me, comes in learning why Marilyn was the icon she was. I’ve never seen any of her movies and I obviously didn’t grow up in an era when she was omnipresent, so I’ve always been a bit baffled by the legend of Marilyn Monroe. How did she so completely capture the hearts of men and women worldwide? There’s no one we can compare her to today for easy reference, because no celebrity alive today is that universally beloved and hyped. To a boy born in 1992, she’s always been an enigma. Williams, however, makes me understand, because by the time the film hit its halfway point, I was head over heels in love with Marilyn Monroe (or at least Williams’ portrayal of her). It wasn’t just her looks. 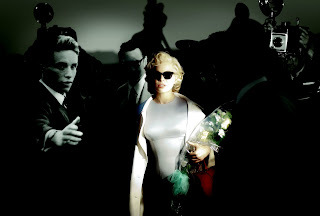 Monroe was gorgeous, and though Williams looks different, she too is a knock-out beauty, but that can’t account for more than fifty percent of what made Monroe irresistible. There were then and are today plenty of beautiful women in the world, but watching Williams act, I understood exactly why one would have eyes only for Marilyn. It was the way she talked; the way she moved; her speech pattern and little vocal eccentricities; her good-natured, warm demeanor; and most importantly, an unshakable sense that she was simply kind and loving to her core, someone just as attractive internally as externally. It’s also the woman the film’s protagonist, 23-year-old Colin Clark (Eddie Redmayne), falls for; the film is really Clark’s story, a factual chronicle of when he met Marilyn while working as an assistant director on Sir Laurence Olivier’s 1957 film “The Prince and the Showgirl.” Clark is an aspiring filmmaker, and working with Olivier (Kenneth Branagh) is a dream come true; working with Marilyn is something else entirely, and as she falls into dysfunction struggling to deliver a great performance, she and Clark begin to bond, eventually spending one week together during the trouble production. I don’t think the script itself is particularly insightful or sharply written, but choosing to focus on one small part of Monroe’s life is an excellent decision; most biopics fall apart trying to cram in the entire life story of its subject, but the limited timeframe of “My Week With Marilyn” allows for an intimate portrait of the superstar at a troubled time of her life. More importantly, it gives Williams room to illustrate many different sides of Monroe in depth, and it is fascinating to watch how her interpretation of Marilyn behaves under these circumstances. Williams’ performance is brave and piercing, baring Monroe’s soul so completely that we can easily understand why a woman so universally adored craved a more tangible kind of love, and slowly destroyed herself in the process. The only performance I’ve seen this year that may have hit me harder is Michael Fassbender’s turn in “Shame,” and even then, it’s a close call. Outside of Williams, the film has some major flaws, most of them revolving around the main character, Colin Clark. I understand why, in theory, Clark would make a good protagonist. He is an everyman, someone we can relate to, so when he starts getting close to Marilyn, we can easily see ourselves in his shoes. The problem is that the part is woefully underwritten and Eddie Redmayne plays him as a total blank; this character is simply a tremendous bore, and putting him next to Williams just underlines his lack of energy. I never found myself caring about the film’s main character or his arc, and the entire experience suffers for it. Sections without Williams are a chore to sit through; when she isn’t around, the film has a stuffy, painfully low-key atmosphere (a problem I also felt plagued last year’s “The King’s Speech,” for instance), and the oppressively generic and manipulative score doesn’t help matters. The script, meanwhile, saddles performers with a lot of thick dialogue that over-articulates certain themes. There’s no reason to give Olivier a speech about Marilyn Monroe’s best and worst qualities when Williams so clearly demonstrated such things five minutes earlier. I ran hot and cold on Branagh’s portrayal of Olivier; on one hand, a larger-than-life figure probably deserves a grandiose performance, but on the other, I had to wonder if Branagh’s jaw hurt from chewing all that scenery. Judi Dench is the film’s only real standout apart from Williams, though her role as Dame Sybil Thorndike is merely pleasant, not revelatory. 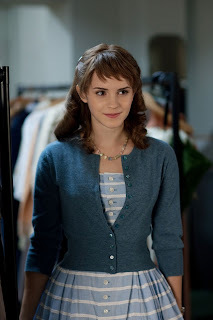 I did enjoy Emma Watson as a costume girl dating Clark; this is the first time I’ve ever seen Watson playing a character other than Hermione Granger, and while it was extremely surreal, Watson continues to be an impressive performer. Having Watson in the film also, in a strange way, emphasized the perfection of Williams’ performance. As a major “Potter” fan, I’ve had a crush on Watson since I was first interested in girls, for at least half my life now. Though she looks as gorgeous as ever here, I had eyes only for Williams’ Monroe from start to finish, and as I explained above, it goes far beyond physical attractiveness. Williams has crafted a three-dimensional human being full of flaws and strengths and warmth, one beautiful on so many levels that I couldn’t even be bothered to notice the actress I’ve been crushing on since I was nine. That’s the power of Williams’ performance. I imagine that’s the power the real Marilyn Monroe had so many decades before I was born. 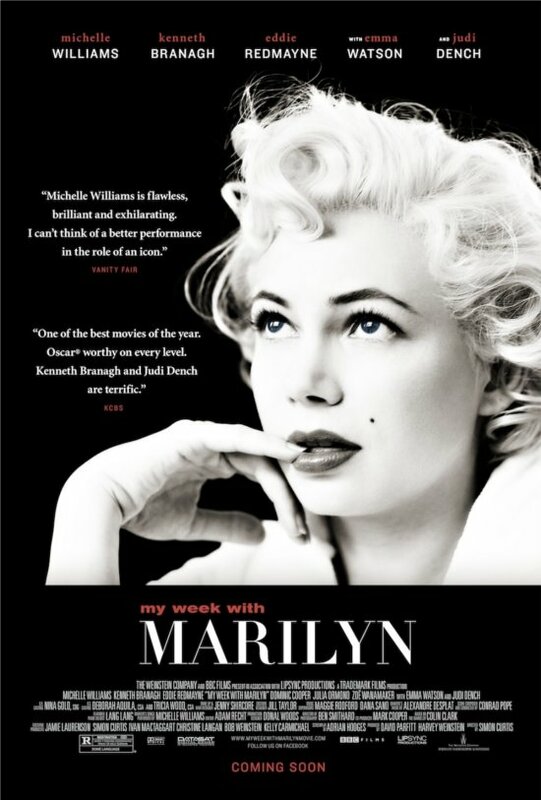 It may not be perfect, but as a pop-culture history lesson, “My Week With Marilyn” simply can’t be beat.